Date - Saturday, November 21 2015. Kickoff Time - 1245 Hrs GMT. 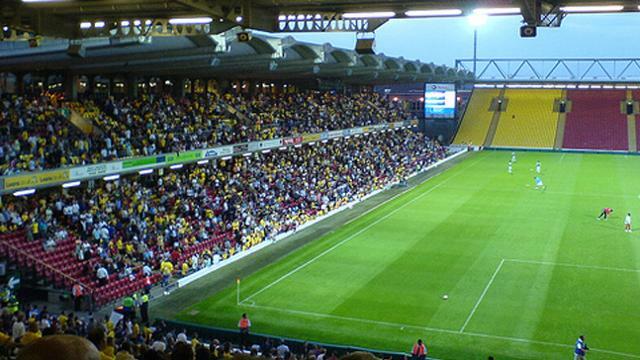 Venue - Vicarage Road, Watford. Luke Shaw, Paddy McNair, Michael Carrick, Marouane Fellaini, Antonio Valencia, Wayne Rooney and ruled out. and Chris Smalling facing late fitness tests. James Wilson is nearing a return to full fitness. José Manuel Jurado and Sebastian Prodl ruled out. Watford Football Club nicknamed The Hornets, The Golden Boys,Yellow Army, and The 'Orns; are a professional football club based in Watford, Hertfordshire; and were founded in 1881 by eventual player Henry Groverand as Watford Hornets, originally an amateur team that turned fully professional in 1897. 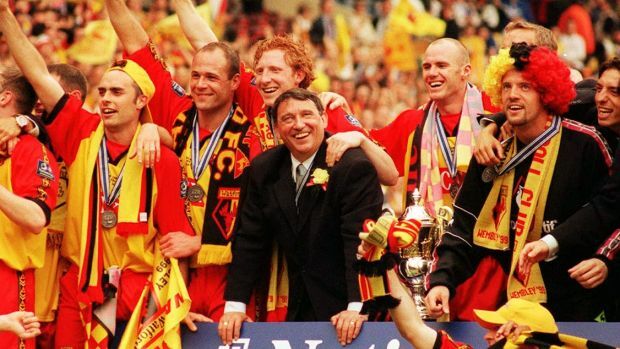 After spending almost half century in the lower divisions of The Football League, Watford enjoyed its greatest era of success following Graham Taylor's appointment in 1977, rising from the Fourth Division to the First Division. 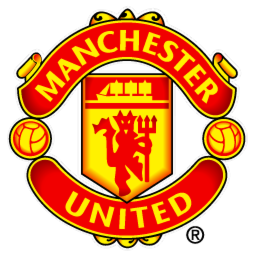 The team also finished second in the First Division in the 1982/83 season, competed in the UEFA Cup in 1983/ 1984, and reached the 1984 FA Cup Final where they faced Howard Kendall's Everton. Watford's most prominent rivalry is with fellow South-Eastern English club Luton Town; and they have been playing their home games at Vicarage Road since 1922. Ighalo has 7 of their 11 goals. Basically stop him and we'll win. They are good defensively, we are good defensively... this could be a boring game. Ugh. Two weeks to wait for this game. I f*cking hate international breaks. Should be winning this, but it won't be a cakewalk. Gone for an edgy 2-0 win, hopefully Watford will open up unlike West Brom. Deeney is a proper workman's clogger, though. He could keep Smalling occupied enough for Ighalo to try his luck against our other CB, which is why I hope Jones will be ready to start this one. I think it's the first time all season we'll play against two up-top. Should be interesting. 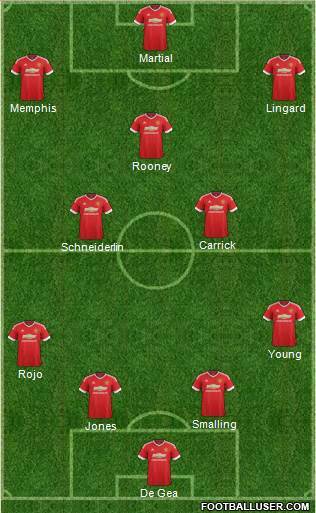 Jones has to start in this one with their duo up front, otherwise I hope the same line up bar Schneiderlin starting. Good point. Despite improving, Blind isn't as well suited to pacey/physical forwards as Jones, so hopefully the latter can stay fit to play this one. Last time we played here, I remember thinking "This Young fellow is quite good".. I'd like to see us try this. that looks nice, I reckon that would work. Mata & Herrera to exchange positions. Hopefully nobody picks up injuries over the break. It'll be a cagey game. Having a season ticket to Watford i know this game could potentially be a 0-0. Watford defend so well and set up primarily to be hard to beat. The only thing i would say is that recently we have they have been attacking a fair bit more. Against Arsenal it was a very tight game for 60 minutes and Deeney missed a great opportunity to set Ighalo through for a tap in before Arsenal scored. United should win this one no problems if our attacking options play like they did against CSKA and West Brom. Honestly i have mixed emotions about this game. Its horrible. Life long United fan but have found myself becoming a passionate Watford fan too seeing them every week for the past 3 years due to the convenience of how close their stadium is to my place of work and I finish work at 1 on saturdays just in time for their kick offs! Deep down if im honest with myself i would prefer the United win, but i don't want Watford to get dicked on and if Watford get anything from the game it would admittedly be a consolation for me. Im going 2-0 to united. I think this'll be a relatively comfortable game for us, we have the resources to keep the ball and catch them on the counter if they play aggressively. 2-0 to United. I cannot imagine Louis to pick Jones over Blind when playing rather weak teams, we need Blind his passing way more than Jones physicality. I'll be in the Watford end though. First time we go into an international break this season with a win. Hopefully no injuries obviously. Need to continue with this winning run. The confidence will come. Lingard is like a new signing, adding some energy into a front line that needed shaking up. One of the surprises of the season so far is that Blind continues to start at CB. He's been at times outstanding and I would think he'll get another start against Watford. I'd like to see him push forward a bit more and with just that one tweak we'll be more effective against clubs which set up to defend on us from the very first whistle. A comfortable 0-3 win for United. don't think Watford will park the bus. They are a decent side and will give it a go at home. Another international break. How boring!!! 2 goals for Luther Blissett who got an obviously very confused AC Milan to pay £1 million for him a couple of years later. Also noteworthy for an appearance in goal for United for the calamitous Paddy Roche who mention of will have United fans of a certain age shaking their heads in disbelief. Paddy Roche is a new name on me - I started supporting United around 1983 and I hadn't heard of him. According to Wikipedia he played for us 46 times but over 9 years - was he mainly the back up / reserve goalie? Went onto play for Brentford and Halifax so I guess he wasn't that good, although he did get 8 Ireland caps. Poor Paddy was a bit of a disaster and is credited by some with derailing our title chances in 1975. Docherty dropped Stepney for him but then brought him back after just a few games due to Roche being all over the shop. He was in goal when we got done 4-0 by City in the League Cup that year prompting me to have to wag it from school for the following couple of days so as to avoid the City fans. Yes, please! I'd obviously like to see Herrera instead of Rooney at #10 but yeah.